Alan Bell has been promoted to vice president of aircraft sales and acquisitions at Aero Charter, Inc.
Alan Bell has been promoted to vice president of aircraft sales and acquisitions at Aero Charter, Inc. In this position, Bell is responsible for all domestic and international aircraft sales and acquisitions. Thomas said that within only six months with Aero Charter, Bell personally signed seven exclusives on jet aircraft and recently sold a Citation in less than 60 days. “As a direct result of his efforts and productivity, numerous prospective clients and customers are on-deck for new business,” Thomas said. In March 1978, Aero Charter, founded by John J. Morgenthaler and Robert A. Thomas, began providing charter service out of St. Louis Lambert Airport. The following year, Aero Charter started providing carrier service for medical transplant teams and organs. Business soared, and by 1983, Aero Charter was established as a prominent charter and management company, operating four turbo-prop and five piston aircraft. Less than a year later, Aero Charter entered the jet market and became the exclusive carrier for medical transplant teams in St. Louis. In 1992, Aero Charter began construction of a new facility at Spirit of St. Louis Airport. After delays caused by the flood of 1993, Aero Charter finally landed in its new 6,000 square-foot office and 12,000 square-foot hangar. The company operated two jets, a turbo-prop and three piston aircraft in St. Louis. In addition to its headquarters, Aero Charter based jets in Toledo, Cleveland, and Detroit. Aero Charter relocated to the southwest end of Spirit Airport in August 1998. The newly constructed complex boasts 8,600 square feet of office space and a 24,000-square-foot hangar. The new Aero Charter complex accommodates the current aircraft, which includes five jets, two turbo-prop and three piston aircraft. In December 2003, a Hawker 800A joined the aircraft inventory, and in January 2003, a Challenger 601-3AER was added to the fleet of aircraft available for charter and the air carrier certificate was expanded to allow customers global access. To provide Aero Charter clients with additional service and convenience, Aero Travel was established in February 1996. Aero Travel, a full-service travel agency located in the same complex with Aero Charter, provides business and vacation travel services, including airline ticketing, rental car arrangements, hotel accommodations, cruises, vacation packages and more. 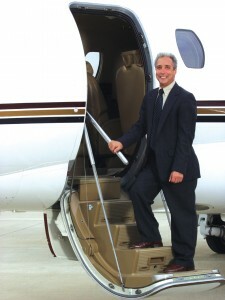 For more information, visit [http://www.aerocharter.com].